It is so cold and snowy here! But I must say, if I look closely, I can see all kinds of shimmer and shine in the dead of winter. Frost glistens on windows, lights twinkle in the night and decorations adorn doorways. 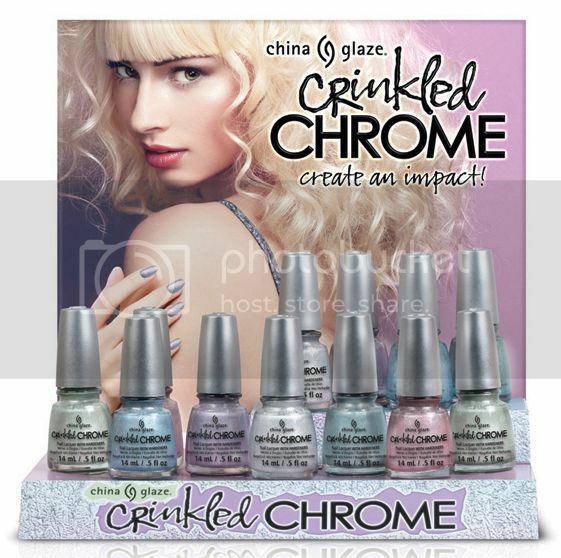 This cold winter season, give your nails a shine all their own with Crinkled Chrome from China Glaze. This is where high-shine chrome meets wintery pastels for a crinkled metal look. The crinkled texture is similar to the textured polishes out there right now. You can create a cool, crinkled impact in one of these six pastel colors. Top Row (left to right): Aluminate (cool silver), I’m A Chromantic (baby pink), Crush, Crush Baby (powder purple). Bottom Row (left to right): Iron Out The Details (icy blue), Don’t Be Foiled (soft teal), Wrinkling The Sheets (light powder green). I am not a huge fan of crinkled polish, but I do like the icy, shimmery tones. My favorite is Don’t Be Foiled. 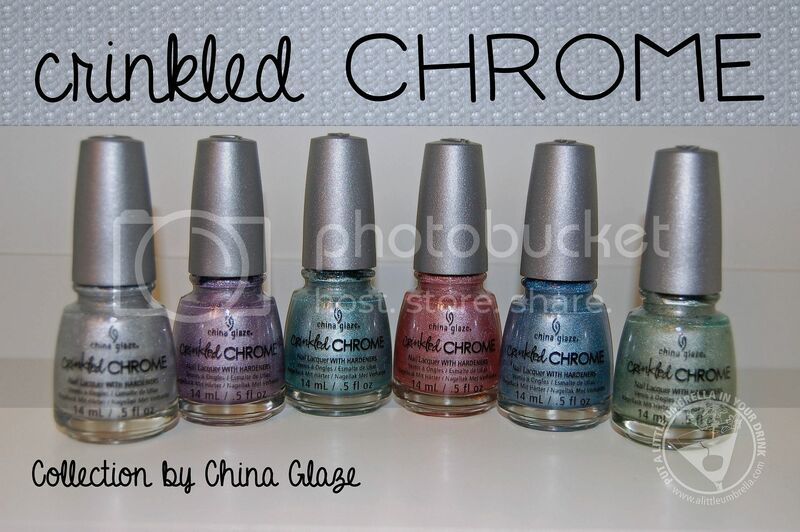 Chrome takes on a feminine flair with China Glaze Crinkled Chrome. These six gorgeous colors retain the sophisticated, polished appeal of the season, but add a contemporary edge and sense of novelty to winter nails. If you are looking for something different and edgy with a cool twist for winter, this would be it! What is your favorite color? Buy It :: The Crinkled Chrome Collection is available now at fine salons and beauty supply stores nationwide.